When my son was younger, he received, as a gift, the book Harry Potter and The Sorcerer’s Stone. He showed no interest in it at all. His teachers at school tried to encourage him to read the Harry Potter series especially after receiving the second book, Harry Potter and The Chamber of Secrets. I suppose if I had shown interest in them, he might have had more encouragement and reason to read them. Twice a month, my friend Glenda and I would take our sons to the movies to see whatever kid’s movie was out. When The Sorcerer’s Stone came out in theaters, it was her turn to take them. I was so relieved it fell on her turn. I knew it was a Sci-Fi, Fantasy film and I really did not wish to go. I grumbled but I wasn’t going to disappoint my son for “movie day.” We ended up going alone. I was very surprised after the movie. I loved it! I fell so in love with Harry Potter, I went home and read The Sorcerer’s Stone that same night. Since my first movie, I have collected all of the books, all of the movies, and all of the video games. All of which I have read, played, or watched at least three times each. When I had started home schooling Reese part of his reading lessons was reading both books. He really enjoyed them. For a child who hated to read, he was looking forward to his reading assignments. I turned to the crowd and said, “Oh hush you devil worshipers!” My son rolled his eyes at me again and went to sit in the front row. We went on to read Harry Potter and The Prisoner of Azkaban and Harry Potter and The Goblet of Fire. At the showing of those two movies, we collected several of my son’s friends and took the whole brood to the movies to see them. We all had a blast! Months before the 900-page book, Harry Potter and The Order of the Phoenix came out, the home school association (religiously based) chastised me for letting him read such material. Even when I said something about the two of us reading the Bible as a Bible School course, they balked. She wanted me to have him read more classical stories like Charles Dickens, Ernest Hemingway, and Nathaniel Hawthorne, to name a few. We did read The Catcher in the Rye, some poetry, short stories and such but we also continued reading the Harry Potter series. Although we started The Order of the Phoenixlate, we did finished in record time near the end of his school year. True to form, when the movie came out, we gathered his friends together and went to see that movie as well. We already had Harry Potter and The Half Blood Prince and I was preparing to start off his next school year with that one. He couldn’t wait though and we started reading it early. I was on vacation in Ohio when Harry Potter and The Deathly Hallows came out. I called every day to ask if she had picked it up yet. “Not yet,” she said for three days in a row. I told her on one phone call, “You better make sure it’s there, I will put you in an orphanage when I get home if it’s not! 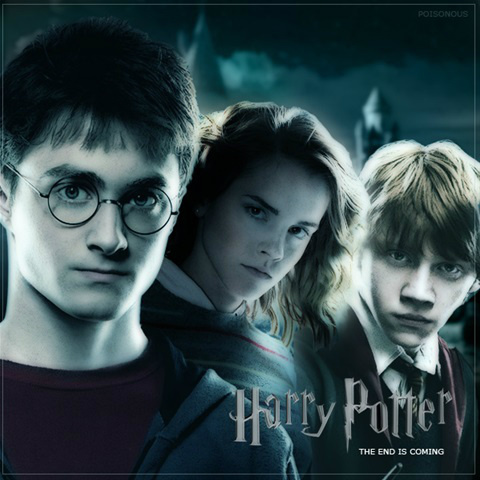 I love you, but I love Harry Potter more,” I sternly said into the phone. “Mom, I’m 22 and I don’t live at home anymore. You can’t put me in an orphanage,” she responding laughing at me. When she finally did decide to pick up The Deathly Hallows for me, she couldn’t find the ticket anywhere. I had my husband search the car for it thinking that maybe we had put it in the glove compartment or something since I’m so forgetful. He does that from time to time when he thinks I will forget to take things with us. It wasn’t there. “I’ll get it, don’t worry,” she promised. On the way home, we found the ticket - it was in the console. I felt bad because I had threatened to turn my daughter into a 12 year old prepubescent child again. When we got home, I found a copy on my desk. Amber had gone and bought it for me so I would have it when we got home. She claims she did it because she loves me, but I secretly think it was because she’s afraid of my magic wand.